Opposition leader claims PM Netanyahu's coalition won't last and predicts 2016 will be an election year. Prime Minister Binyamin Netanyahu is “tired” and has nothing else to offer, opposition leader MK Yitzhak Herzog (Zionist Union) charged on Saturday. “The Israeli public is concerned because for many years they have been fed the paradigm that ‘we live by the sword’ and ‘we don’t have a partner for peace’, but I have a real obligation to present an alternative, and I and the camp I head are the only alternative to Netanyahu,” he continued. 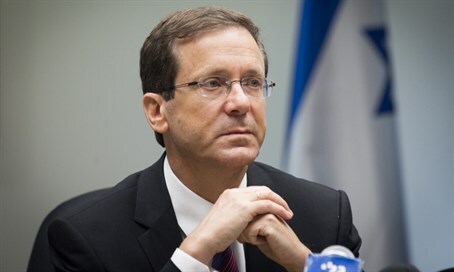 Herzog said the current wave of terrorism should be concluded with security-related or diplomatic measures. "This is an era of a regional revolution and radical Islamic movements in the form of ISIS, Hezbollah, Iran and so on," he said. "I do not mean to say that a diplomatic move could put an end to the Islamic Jihad, but it certainly could bring the moderates to denounce it. Some of the terrorist attacks are being carried out in direct relation to the Israeli-Palestinian conflict, and some are the result of a radical jihadist brain washing. But precisely now is the time for negotiations with the Palestinians and with the moderate elements of Islam and the region, including countries like Jordan, Egypt, Saudi Arabia and the Gulf states,” added Herzog. Yesh Atid chairman Yair Lapid, he claimed, “prevented us from forming a big bloc in the last election, which was supposed to bring victory, and the next time we will not allow him to do so. I work hard all the time to build as large a bloc as possible before the next elections - this is the only option to replace Netanyahu. I speak with a lot of factors, movements, and other groups in order to form a broad democratic mosaic, and I will not go into details who exactly I am speaking to. Netanyahu is tired and he has nothing more to offer to the public."